A year-long unique experiment carried out by the City of Vilnius together with the VGTU (Vilnius Gediminas Technical University) was last week presented at the EUROCITIES Culture Forum in Lisbon. The neuro-analytical system developed in the capital under the HORIZON 2020 Programme ROCK (Re-use and Optimisation of Cultural Heritage in Creative Knowledge Cities) may become one of the most innovative tools for planning public urban spaces. Launched last year, the neuro-analytical system, which measures average emotions, physiological parameters of impersonalised people in the centre of the city and finds out how people feel in public urban spaces, can become a very important tool in the future not only for our own urban planners but also for other participants in the Horizon 2020 ROCK project. The City of Vilnius is involved, through the ROCK project, in a unique experiment carried out together with the Vilnius Gediminas Technical University. The neuro-analytical system captures human emotions at important points of the city. As traditional interviews are no longer considered as reliable data for urban planners, our project can be an answer to how to find out whether residents and city visitors like the existing and new public spaces or events taking place there’, says Dalia Bardauskienė, Vilnius City ROCK Project Manager. Over the next stages of the project, the data collected from the neuro-analytical system will help produce integrated maps of emotions and physiological conditions as well as air pollution and air conditions (temperature, wind, precipitation) maps and a personalised guidance system, which should help urban planners to create a more comfortable urban environment and services that best meets the needs of the people. The system sensors will record and store information throughout the year. The neuro-analytical system has been operating, since November last year, in Pilies Street, Gediminas Avenue and the vicinities of Lukiškės Square, while capturing the average mood, physiological data, reactions to the environment, events, processions/demonstrations, etc., in passing people. ‘The neuro-analytical system recognises 7 main human emotions (joy, sadness, anger, surprise, frustration, boredom, and neutrality), emotional condition (boredom, interest and confusion) and physiological parameters (face temperature, respiratory rate, pulse, age, gender). The analysis of these impersonal data look into the aggregated level of happiness, it takes into account the human mood and the environment affecting the physiological condition: circadian rhythm, days of the week, magnetic activity of the earth, air temperature, wind, humidity, etc.’, says Artūras Kaklauskas, ROCK Project Manager on the part of the VGTU. The three important points selected have not been accidental – they have a historical, architectural and cultural significance for Vilnius and its inhabitants. 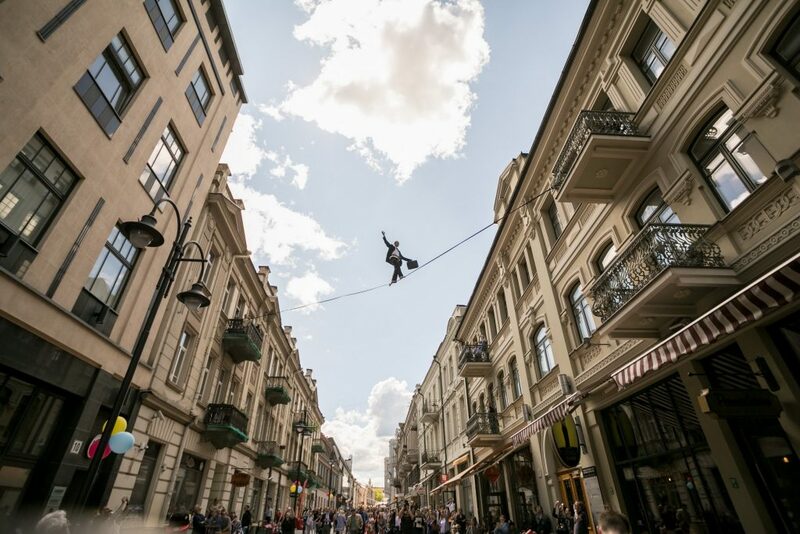 What is more, Pilies Street and Gediminas Avenue are the busiest areas hosting major events of the city and the largest flows of tourists, and Lukiškės Square is a newly emerging public space. This experiment is expected to help compare the mood, emotions and air pollution and the conditions (temperature, wind, precipitation) and to answer the question of whether this space is liked by people visiting there. ROCK project research has produced thousands of moderate and strong correlations between human emotions (cheerful, sad, angry, surprised, frightened, bored), emotional state (boredom, interest and confusion), physiological parameters (facial temperature, respiratory rate, pulse) air pollution and conditions (temperature, wind, precipitation). Neuro-analytical sensors could be useful not only for urban planners in the future, but also for business planners who can create individualised services, for example: how to trigger movement in certain old town spots, how to activate some areas, establish target groups and the time best for approaching with services or products. The neuro-analytical system developed by the VGTU and the City of Vilnius aims at capturing, collecting and analysing human emotions in public spaces by adding additional data and combinations of information layers, which will later serve to generate emotional and physiological and pollution maps of the public spaces and offer customised recommendations. Towards the end of this year, the data collected through the neuro-analytical system will be integrated with an online opinion analyst, which will analyse articles, reviews, surveys, comments, opinions, reports, surveys, blog posts, online forums, Facebook, Twitter and other social media channels at the given time. This will visualise people’s opinion about the cultural heritage of the city, buildings, events, services provided, etc. The VGTU scientists hope that this online opinion analyst will help to better and easier understand and analyse thoughts, feelings, attitudes and opinions of the city population on issues of relevance for the city. The three-year project will provide the participants with a possibility of looking into innovative strategies for the renewal of historic urban locations through the use of cutting-edge and maximum environmental friendly models, while increasing the security of participating cities, promoting community initiatives that best meet the needs of the people. Role model cities, including Vilnius, should help their counterparts that seek to follow in their footsteps in sharing the accumulated practice, expertise, skills and systems developed by the VGTU that can help assess the quality of public spaces through the prism of emotions and air pollution and conditions (temperature, wind, precipitation) and help planning healthy, busy public spaces, and hence generate positive emotions. The EU-funded Horizon 2020 Project ROCK involves 9 municipalities, 5 universities, business associations, companies, and experts. Leading partners are Bologna City Municipality and Bologna University. The participating cities are divided into Role Models and Replicators. Vilnius is selected as one of the exemplary cities, which can convey its experience to other cities. It relates to the renewal of the Vilnius Old Town – the UNESCO World Heritage Site- its presentation and promotion of the heritage value, development of communal awareness of the heritage and involvement in the renewal and renovation processes. This project is financed by Horizon 2020 – the biggest EU Research and Innovation programme.